An improved version of this product is now available. Click here for more details. The TOTALArrest™ RNA kit isolates total RNA from contaminating DNA, proteins and nucleases using our proprietary binding matrix, pinkRESIN™. 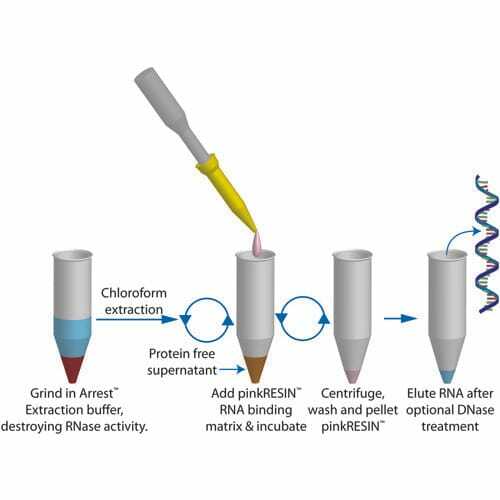 The absence of phenol and chloroform extractions make the TOTALArrest™ RNA kit one of the safest methods for isolating and purifying high quality RNA. The 60 minute protocol is simple; after homogenization, RNA is bound to pinkRESIN™ and washed. The protocol provides an option to remove contaminating DNA with a single DNase treatment. Finally, RNA is eluted from pinkRESIN™. The eluted RNA is ready for further applications, including Northern blots, dot blots, RNase protective assays or reverse transcription. The kit is offered in two sizes, micro or medi, supplied with components sufficient for 50 preps (10 to 50 milligrams tissue per prep) or 10 preps (100 to 500 milligrams tissue per prep), respectively. 1. 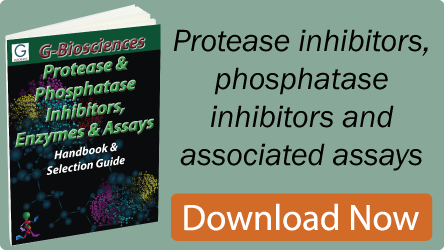 Arrest™ Extraction Buffer lyses samples, instantly destroying RNase activity. 3. After a brief washing step, pure, protein-free RNA is eluted.